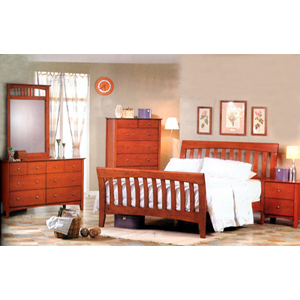 5-Pc Brandy Finish Bedroom Set. Includes: Brandy Finish Slat Design Queen Bed, Night Stand, Dresser, Mirror, Chest. Pieces Are Also Sold Separately. Easy To Assemble. Strong Construction. Details: Bed: 92-3/4L. X 63-3/4W. X 48H., Night Stand: 24W. X 18D. X 26-1/2H., Dresser: 64W. X 18D. X 34-1/2H., Mirror: 37W. X 1-3/4D. X 47-3/4H., Chest: 38W. X 18D. X 52H..